« Day 98 – Chris H.
Day 99 – Emily H.
I am still behind on posting my giving experiences. Today’s post is from last Tuesday! I’m going to try to start ‘posting two a day until I get caught up. 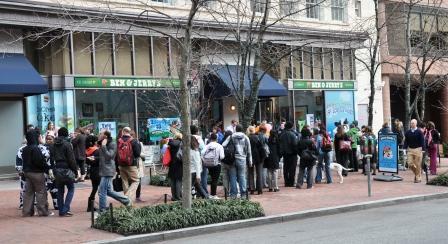 I was walking home from a meeting and noticed a large line outside of the Ben & Jerry’s scoop shop south of Dupont Circle on 19th Street. As it turns out it is Customer Appreciation Day where they give everyone a free scoop of ice cream. Ben & Jerry’s doesn’t stop there though, they also partner with cause related organizations to give them an opportunity to fund-raise. Here’s how it works. Ben & Jerry’s allows the charitable organization to be present and ask for donations on free scoop day. In addition, if a patron donates $2 or more, Ben & Jerry’s gives the donor a 10% off card valid for all purchases for a year. Great idea! I had to stop. 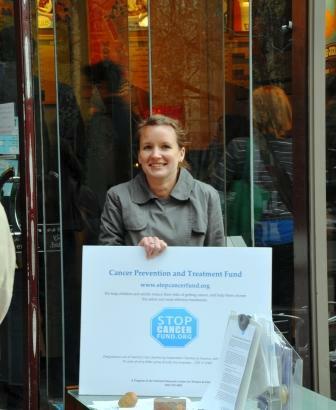 The organization asking for donations was Cancer Prevention and Treatment Fund. I donated $5 to the organization and then decided to try to give my $10 to person asking for donations. Originally from Arizona, Emily is a Research Assistant with the organization. It was quite chilly that afternoon and Emily looked like it was taking a toll on her. Her face was tight and body scrunched together as she tried to stay warm. Her coat sleeves provided little relief for her exposed hands that held her sign. There were several interns helping Emily get donations. They would tell the people in line that they were accepting donations for the Cancer Prevention and Treatment Fund as well as explain the added benefit that patrons would receive by donating more than $2. At some point the interns had to leave and Emily was left by herself. I noticed that the donations slowed down as people were just walking by Emily. I had a few minutes to spare and offered to walk up and down the line and tell those waiting about the opportunity to donate and receive the Ben & Jerry’s discount card. I did this until 5:30 when a fresh set of volunteers were scheduled to arrive. I had to get going and said goodbye to Emily. A few hours later I received the following email from Emily! I was so excited to do something with my $10 but was not sure that “something” would be blatantly obvious. I was wrong. Not only did I have the opportunity to use my $10 for someone else’s well-being, but it happened a mere 2 hours after meeting you. I was freezing cold after working outside trying to get donations for the organization I work for and just wanted to get home. Upon trying to enter the blue line platform [on the Metro], I discovered the blue line was having massive issues. It was going to be a very long wait to even board a train. I decided I would get a drink and wait it out. Perfectly logical, right? As soon as I stepped outside it began to pour rain. After running into the nearest bar and discovering there was not a single seat, I settled on a nearby Subway. As I tried to rush in the doors from the rain I was approached by a seemingly homeless female. Now, my personal policy is to not give money to homeless individuals. This is not because I am heartless; rather, I prefer to make donations elsewhere to places I have a better idea of where my money will go. So when she started to ask me–I already had my mind made up–I said no. What I didn’t process until after I had said no, was that she didn’t ask for money–she asked for a sandwich. I promptly ordered 2 turkey meal deals. She was very thankful and is currently eating her sandwich across the room from me. I wonder what her story is. Thanks for the opportunity to make someone’s day. I’m still in subway typing this email out…I couldn’t wait to share my ten dollar story. on March 29, 2010 at 1:00 pm | Reply sharon v.
Similar to Emily, I also prefer to donate to shelters rather than the folks on the corners. However, having your website in mind Saturday, I rolled down the window at the intersection and handed over the cash I had. The gentleman was gracious and it made a beautiful day even better. There is always a man standing at the parking lot of a grocery store where I go for lunch from time to time. His sign asks for canned fruits, vegetables or hygiene items. I rolled down my window and gave him five dollars from one veteran to another. I’m not sure how he will use the money, but I could not just continue to pass him by. Hello! I received a donation from Sonia & Rick of Temecula, CA with a sweet card that said they had read this entry and that what prompted the donation. Thank you Sonia & Rick, and also Reed!